I’m usually brave when it comes to making different kinds of Thai food, but for some reason I was hesitant to even try making Thai rice porridge, thinking it seemed too daunting for some reason. So I didn’t. Rocco ate infant rice cereal, sweet potato, avocado, carrots, bananas, yogurt, all the usual American baby foods, but no Thai baby food, jok. But with my Milana, I wasn’t going to let my chance at serving her traditional Thai baby food pass by, even though we live in Austin with no Thai rice porridge street vendors around. I almost chickened out again, but this time I got over my fear of thinking I might mess it up and just made it. 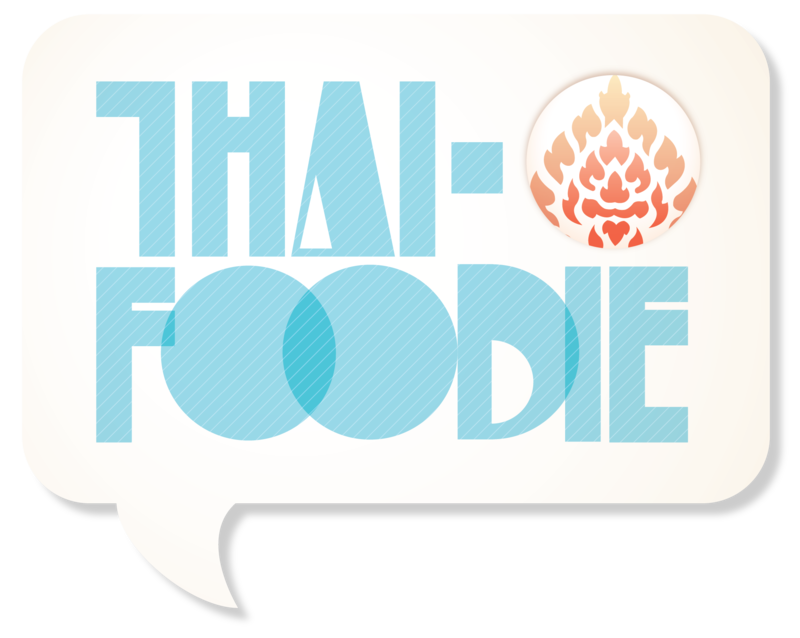 by Leela Punyaratabandhu that gave me the courage to attempt something new in my Thai cooking repertoire! 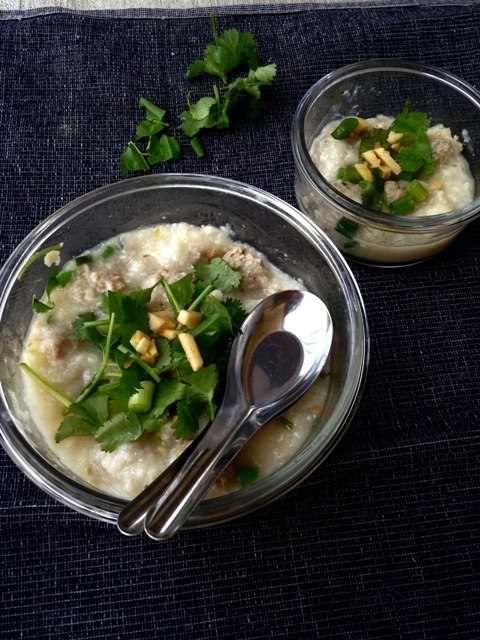 If you want to try something new for breakfast, try out savory Thai rice porridge with pork dumplings! In a food processor, combine all the pork dumpling ingredients and process until smooth and sticky and then refrigerate. In a blender, combine rice and broth, and blend on low to a coarse puree, the texture of steel cut oatmeal. Be careful not to over-blend it, or you will lose the texture of the rice. Pour the puree into a 1-gallon saucepan, and place over medium-high heat. Bring to a gentle boil. Stir it occasionally to make sure the bottom doesn't burn. Whisk together the tapioca flour and water until blended. Add it to the rice mixture while stirring. Let the rice porridge boil gently. Continue to stir it to prevent it from burning for about 2-3 minutes, or until thickened. Lower the heat so the porridge bubbles a little. Take the dumpling mixture out of the fridge, and roll it into balls about 1 in. or so in diameter. Drop the balls one at a time into the rice porridge. When all the dumplings have firmed up, after 2-3 minutes or so, the rice porridge is ready to serve. To make the coddled eggs, bring a small pot of water to a boil. Put each of the eggs, in a separate heat-proof container like a tall mug. Once the water is boiling, pour the boiling water over the eggs with a few inches of water above them. Let the eggs sit for about 10-15 minutes, depending on how cooked you like your eggs. 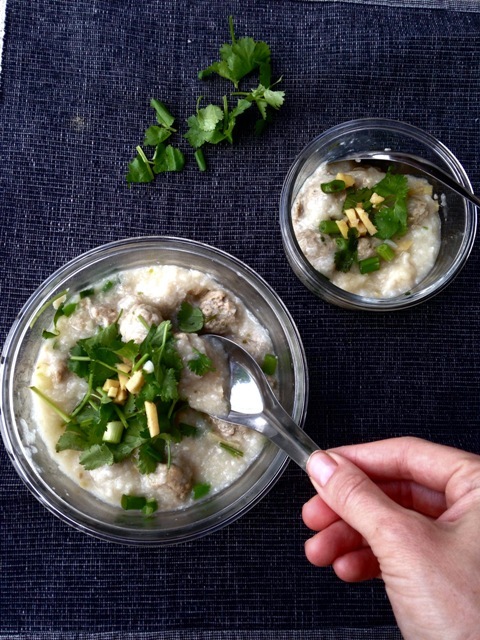 Ladle the rice porridge and pork meat balls into four bowls. Crack an egg into each bowl, and sprinkle the green onion, ginger and cilantro leaves on top. Add fish sauce and red chile powder to your liking. 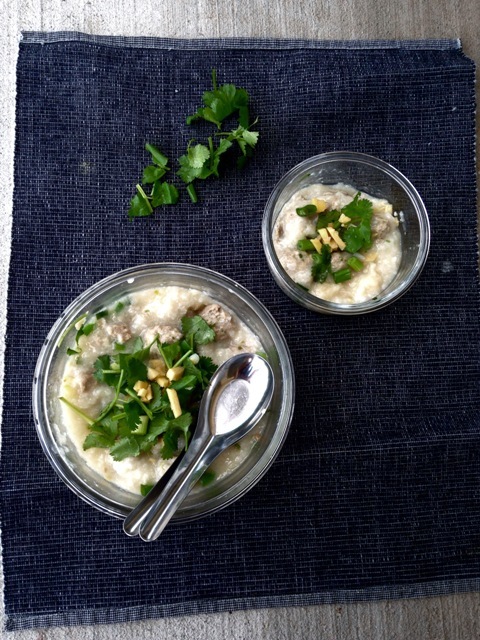 If you want to make Thai rice porridge baby food, just leave out the toppings and egg. You can try to break up the pork dumpling and mix it in the porridge too, or leave it out. Thanks Heghineh! I hope you enjoyed it! !